More and more companies are adopting a 'mobile-first' strategy after understanding the importance of getting in front of the customer via mobile – the most current and viewed channel. Mobile has become the most convenient channel for interaction between brands and customers, for communicating both transactional information and marketing messages. 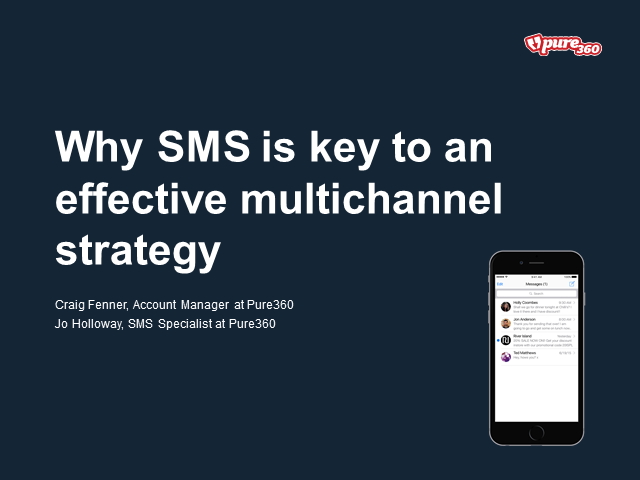 Join Craig Fenner, Account Manager at Pure360 who will explore why SMS is key to an effective multi channel strategy and can be used throughout the customer's life-cycle to maximise ROI.